Wirelessly share your music with Bluetooth connectivity. DAB and FM radio with 20 presets available. 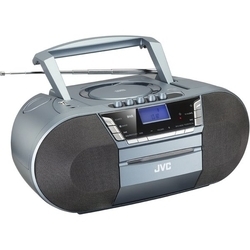 CD and cassette players for playing music in a nostalgic way. Stream music wirelessly from your smartphone or tablet to the JVC RC-D327B DAB/FM Bluetooth Boombox. Bluetooth R provides the perfect way to share songs from your digital library or favourite streaming service. Access a huge range of radio stations with the DAB and FM connectivity. And with 20 presets available you can tune directly in to your most listened to channels.